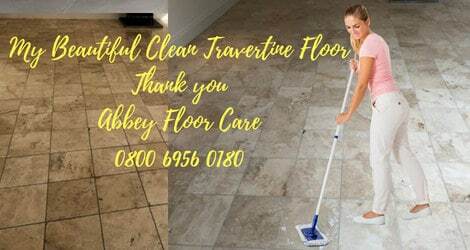 This project, Travertine Cleaning Blackheath London, had three principal objectives. 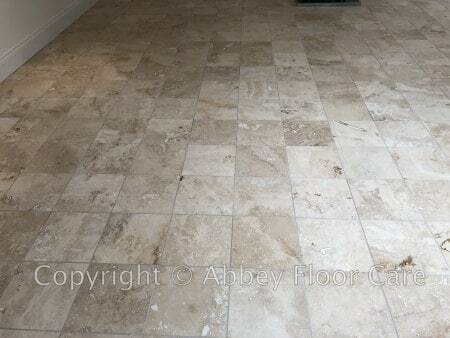 Deep clean the Travertine tiles and dirty grout. Grout fill holes in the tiles, caused by the original filler coming away. Fill ugly cracks in the floor caused by movement in the subfloor. 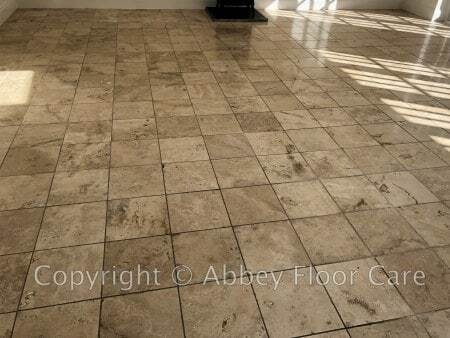 Whilst the floor was quite soiled, the surface of the Travertine tiles was in remarkably good condition. Most of the tiles still had the original honed surface that often wears away. 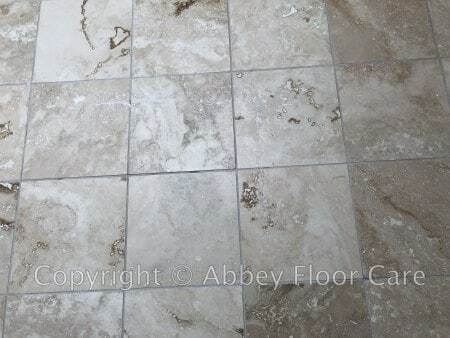 So I started the Travertine cleaning Blackheath London project by applying my Travertine cleaner and scrubbing the cleaner into the surface of the tiles and grout using a soft scrubbing machine. The cleaning lifted most of the soil away from the surface of the floor. Finally, I pressure rinsed the floor with clean water to remove the emulsified cleaner and lift any remaining ingrained soil out of the grout and the tiles. I removed 99% of the ingrained soil. Some soil had migrated deep into small voids, that could not be reached by the cleaning process. The only way to remove these small areas of ingrained soil would have been to grind the surface of the tiles. I did not want to grind the floor as the grinding process would have revealed more holes. The homeowners were more than happy to follow my advice, as they were delighted with the cleaning. There were lots of holes in the floor. The image above shows some of the larger holes, marked by masking tape. I filled the holes with Jasmine colour Epoxy Grout. Once hardened, the grout fill is very stable and very hard. It is unlikely to come out during the life of the floor. At the same time, I removed some old hole repairs that had gone soiled and ugly. The travertine had cracks across the floor in multiple directions. This was probably a result of movement in the sub-floor. The cracks had filled with soil and looked like ugly black lines across the floor. I could open the cracks with a diamond cutting wheel before filling. However, this would have made the Travertine repairs very noticeable. 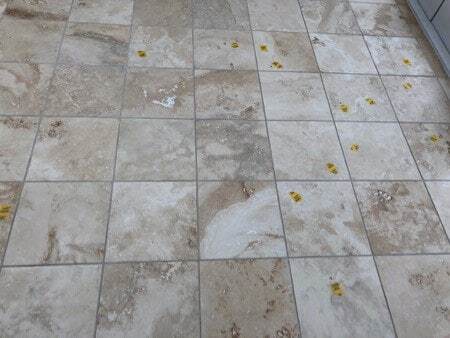 So after discussing the situation with the homeowners, we decided to fill the cracks with Jasmine coloured epoxy grout without opening the cracks. 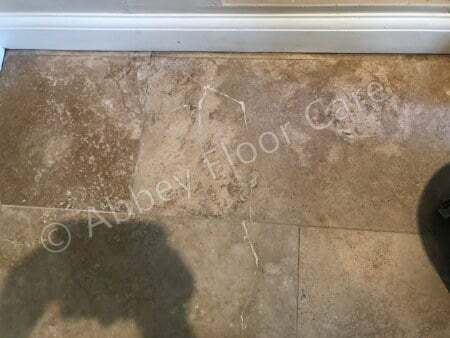 The homeowners were delighted with the results and commented that many of the crack repairs blended into the pattern of the Travertine, making them less noticeable. I left the grout repairs overnight to allow the grout to set ready for sealing. I sealed the floor with 2 coats of Impregnating sealer to help protect the floor against water and oil-based spills.